Wow. What a race! And in Bahrain too. Sunday's Grand Prix did away with the traditional Middle East snooze and instead we had a mid-afternoon thriller in the desert as the latest breed of thoroughbreds showed just what F1 2014 can be like. We saw great racing all through the field (well from 21 of the drivers, though I still can't decide if Maldonado's move on Gutiérrez was a desperate dive or a freak racing incident) and the result wasn't set in stone until the chequered flag. OK it was partly because of the safety car but fifth placed Nico Hülkenberg finished just five seconds ahead of Kimi Räikkönen in tenth. I hate to focus on the race winner, particularly when they've got so much credit already, but Lewis Hamilton's drive in the Bahrain GP was exquisite. Excluding the safety car period, Hamilton and Rosberg were pushing for every corner of every lap. And Hamilton didn't put a foot wrong. One could argue that this was his finest win, battling against a teammate in a faster car with the softer tyres and coming out on top with a masterful drive. The two Mercedes started the race alongside each other for the first time this season and they made their intentions clear at the start. Rosberg squeezed the Brit tight to the pit wall with Hamilton showing grit and determination to slide down the inside into turn one, holding off Rosberg down into turn four. After a fantastic battle late in their first stint, Mercedes split their strategies and Hamilton took the soft tyres, giving him the advantage but leaving Rosberg the faster tyres for the final stint. Having built up a comfortable cushion to hold off Rosberg, it was washed away in an instant as the safety car came out and left the Silver Arrows nose to tail. 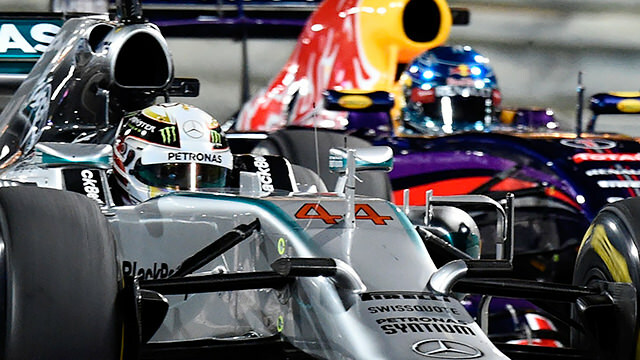 Many expected Rosberg to breeze past on the soft tyres and take an easy win. Others thought that the race result had been decided by team orders already, but what was to follow proved them all wrong. An epic ten lap race to the flag ensued that kept the fans guessing right up to the final lap, with Hamilton prevailing and setting down a marker for the rest of the year. To his credit, Nico Rosberg drove impeccably too, though you could see him get more desperate as the race went on. I tell you what though, if the pair of them are in this mood all year, it’s going to be a fascinating season. He may not be the future star that others on the grid are, but Max Chilton is doing the job for Marussia, and none more important than his thirteenth in the Bahrain GP, regaining the all-important tenth place in the constructors’ championship. Starting from the back row of the grid, Chilton was his usual consistent self, driving a little slower than his ultimate pace but after his first stop, he had more confidence in the car and was able to kick on and fight the Caterhams and Jules Bianchi. Chilton benefited from being unlapped under the safety car to split the Loti after Pastor Maldonado served his stop-go penalty. Chilton beat his nearest ‘competitor’ Kamui Kobayashi by nearly 30 seconds, and teammate Jules Bianchi by nearly two minutes in a race that will go a long way to securing his future within the team. You have to give serious credit to Sergio Pérez for his Bahrain GP performance after such a horrendously unlucky start to the season. In fact, his whole weekend deserves credit as he put his much-heralded teammate in the shade. He showed real potential in practice and delivered when it mattered, securing fifth place qualify when Nico Hülkenberg was eliminated in the second segment of qualifying. Pérez was four tenths faster in Q2, showing just how much he enjoys this track. In the race, he was in an epic five-way battle for the final spot on the podium with his teammate, the two Williams and Fernando Alonso. Pérez’s two stop strategy and evident pace advantage to his teammate had him in the pound seats, but the safety car allowed another couple of contenders to enter the ring: the Red Bulls. And Pérez duly obliged, unceremoniously shoving teammate Hülkenberg wide into turn one on the restart and then holding off Daniel Ricciardo in the final few laps to secure only Force India’s second podium (by the way, I was there for their first in Belgium 2009, and predicted Giancarlo Fisichella on pole that day). 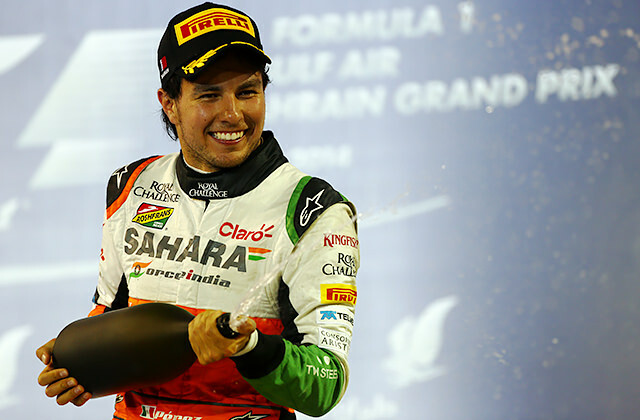 After a torrid start to the year, you have to feel good for ‘Checo’. He showed terrific racecraft to pull off outstanding overtakes on Felipe Massa and teammate Nico Hülkenberg, not to mention fending off a whole host of drivers throughout the race. And while I was expecting Hülkenberg to come good and secure his first F1 podium, it was Pérez who rose to the occasion to secure his fourth podium of his career. Who would have thought that Pérez would have four more podiums than his favoured teammate? Once again, Daniel Ricciardo proved that he is a future star, outclassing four-time world champion Sebastian Vettel over a weekend for the second time in three races. While Vettel languished in Q2 again, Ricciardo was up at the sharp end, flying the flag for Renault against the dominant Mercedes power unit. His harsh penalty from Malaysia made his race even more spectacular. A solid drive had him following his teammate in seventh during the safety car. And then the claws came out, as he aggressively fought past Sebastian Vettel into turn one in a move that had significantly more importance than just sixth place and then he put a calm and collected move on Nico Hülkenberg to move into fourth after Jenson Button had retired. He then went after Sergio Pérez’s podium but he came up just short. If only the Red Bull had shown that kind of pace all weekend. Though the safety car did set up a grandstand finish, it did rob us of a great tactical spectacle to match the on track action. Before Esteban Gutiérrez's barrel roll, the two three-stopping Williams were in a tense battle for the final spot on the podium with the two-stopping Force Indias. But Williams' strategy was ruined by the safety car and suddenly Massa and Bottas faded into the obscurity for seventh and eighth, leaving Force India to score crucial points in the championship battle. Their pace was better this weekend, though still not as good as predicted, but they will live to rue former driver Pastor Maldonado’s clumsy move.